Watercress is an aquatic perennial herb found in abundance alongside slow running water ways and nearby natural springs. This peppery flavored greens has been in cultivation since ancient times for its food and medicinal uses in East-Asia, Central Asia, Europe, and Americas. Botanically this fast growing, leafy vegetable belongs to the Brassicaceae family, and closely related to mustard greens, garden cress, cabbage, salad rocket (arugula), etc. Scientific name: Nasturtium officinale. Watercress is a free floating hollow stemmed plant. Its small, oval, deep green succulent leaves carry high moisture content. Its leaves feature sharp, peppery and slightly tangy taste, somewhat like tender mustard greens and garden cress (Lepidium sativum). Racemes of tiny white flowers appear in summer, which turns into small pods containing two rows of seeds. Its mature seeds are also edible. Cress is one of the very low-calorie green leafy vegetables (only 11 calories per 100 g raw leaves) and contains negligible amounts of fats. Being an antioxidant rich, low-calorific and low-fat vegetable, it is often recommended in cholesterol controlling and weight reduction programs. According to the study published in Centers for disease control and prevention (CDC) journal, researchers at William Paterson University at New Jersey, watercress is labeled as the most nutrient dense food, and for the same reason, it tops the list of "powerhouse fruits and vegetables". Cress leaves and stem contains gluconasturtiin, a glucosinolate compound that gives the peppery flavor. Research studies suggest that the hydrolysis product of gluconasturtiin, 2-phenethyl isothiocyanate (PEITC), is believed to be cancer preventing by inhibition of phase-I enzymes (mono-oxygenases and cytochrome P450s). Fresh cress has higher concentration of ascorbic acid (vitamin C) than some of the fruits and vegetables. 100 g of leaves provide 47 mg or 72% of RDA of vitamin C. As an anti-oxidant, vitamin C helps trap free-oxygen radicals and reactive oxygen species (ROS) through its reduction potential properties. Lab studies suggest that regular consumption of foods rich in vitamin C help maintain normal connective tissue, prevent iron deficiency, and also help the human body develop resistance against infectious agents by boosting immunity. It is one of the excellent vegetable sources for vitamin-K; 100 g provides over 200% of daily recommended intake. Vitamin K has potential role in bone health through promoting osteotrophic (bone formation and strengthening) activity. Adequate vitamin-K levels in the diet help limit neuronal damage in the brain; and thus, it has established role in the treatment of patients suffering from Alzheimer's disease. Cress is also an excellent source of vitamin-A, and flavonoids anti-oxidants like ß carotene, lutein and zea-xanthin. Further, it is also rich source of minerals like copper, calcium, potassium, magnesium, manganese and phosphorus. Potassium is an important component of cell and body fluids that helps controlling heart rate and blood pressure by countering effects of sodium. Manganese is used by the body as a co-factor for the antioxidant enzyme, superoxide dismutase. Calcium is required as bone/teeth mineral and in the regulation of heart and skeletal muscle activity. Watercress earned its reputation as a healing herb quite early. Around 400 BC, Hippocrates located the first hospital on the island of Kos close to a stream to ensure that fresh watercress would be available for treating patients. In the 1700s, Nicholas Culpeper (author of Culpeper's Herbal) believed watercress could cleanse the blood. Modern science has identified more than 15 essential vitamins and minerals contained in this one herb – more iron than spinach, more calcium than milk, and more vitamin C than oranges. Vitamin K is by far the most prominent nutrient in watercress, with 312% of the daily recommended value. It forms and strengthens the bones and limits neuronal damage in the brain, which is helpful in treating Alzheimer's disease. There's also vitamin C, with 72% of the daily value, closely followed by vitamin A with 64%. Vitamin C provides top-notch infection-fighting power to stave off colds and flu, help maintain healthy connective tissue, and prevent iron deficiency. Vitamin A, also known as retinol, is essential for a properly functioning immune system and produces pigments in the retina of the eye, an absence of which can cause night blindness. Growing evidence suggests that lutein and zeaxanthin may also offer important protection for the cardiovascular system. Individuals with higher blood levels of lutein and zeaxanthin were found to have less atherosclerosis of the arteries of the neck than those with lower blood levels. Furthermore, people with higher blood levels of lutein were less likely to succumb to a heart attack than those with lower levels. According to David Hudson, the Subtle Energies site and many other Ormus sites, Watercress is among the top for high amounts of ORMEs, especially Rhodium and Iridium. 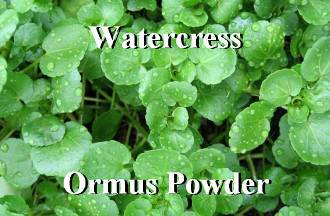 I made this Ormus powder by taking Watercress leaves and making a strong tea with harmonically structured water. 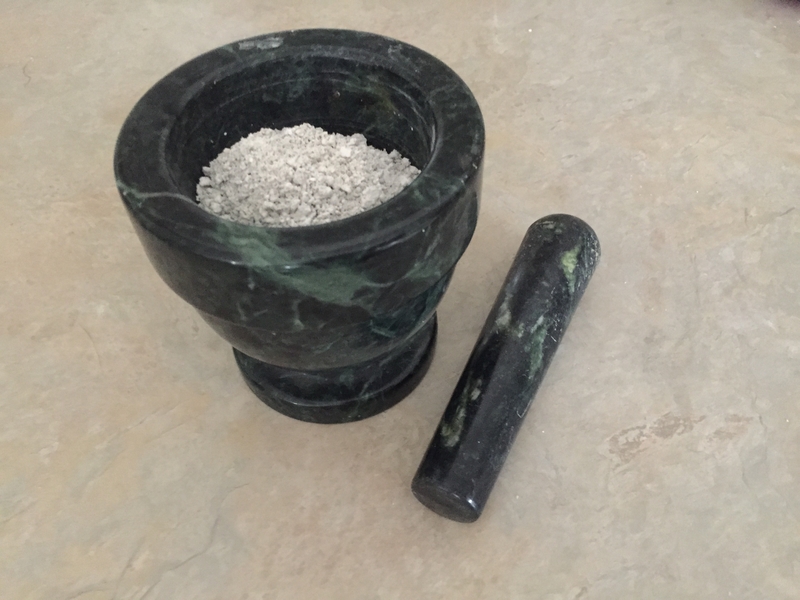 Then I preformed the John Hudson Method, by adding Organic Dolomite Lime and swinging the PH. Then after 7 washes and letting it dry this White Powder is full of Ormus goodies.